Kyle Fiedler (left) talks with Nat Lownes, his partner in the creation of a program to visualize starting lineups for all Major League Baseball teams using existing databases. PHILADELPHIA One of Philly Tech Week's new events had a shaky start Sunday, but it wasn't a complete strikeout. Baseball Hack Day, a Boston event brought to Philadelphia for the first time to encourage baseball-themed app and website designs, went on despite a six-person turnout at Indy Hall in Old City. The 2012 and 2013 events in Beantown each drew about 30 participants, who were divided into working teams of two or three. 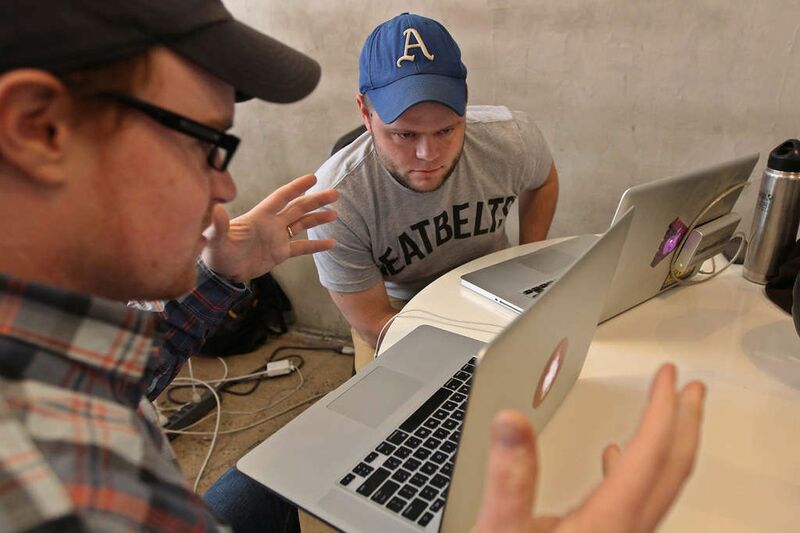 "It's just a day where we get together and chat about baseball," said organizer Kyle Fiedler, 28, a developer at Thoughtbot Inc. who moved to Philadelphia from Boston last year and who wanted to replicate his Baseball Hack Day experience in the Hub here. "Because there's such a targeted audience of developers or designers and people who love baseball, it's a lot easier to have those kinds of conversations," Fiedler said. He was just hoping for a bigger crowd Sunday on Third Street, otherwise known as "Nerd Street" because of the proliferation of small tech companies there. Indy Hall, a multipurpose coworking space for designers, developers, artists, and others, sponsored Baseball Hack Day along with other city tech businesses. The goal of the event is for software developers and designers to collaborate and compete to create apps, tools, and websites with baseball themes in under eight hours. Winners receive Phillies tickets, and runners-up get a gift certificate for an hour at Everybody Hits batting cages on Girard Avenue. "I think this is a magical combination," said one of Sunday's participants, Jack Amoratis, 37, a Philadelphia native who "was brought back here by the technology." Amoratis and O3 World coworker Mike Gadsby on Sunday worked on a Web app to compile hitting statistics for player recommendations. Alex Olson, 28, and Abdus-Salaam Muwwakkil, 22, created heat maps showing which stadium seats had the best odds for attracting foul balls. "There's not a lot of data on foul balls," said Muwwakkil of the New Africa Center, an African American Muslim cultural organization. "We've narrowed down particular areas on the baseball field where foul balls go." Fiedler said the creations at Baseball Hack Day are usually designed from a fan's perspective. "Sometimes they're really nice-looking and they're not finished," Fiedler said. "And sometimes they're really basic-looking and they work great." On Sunday, he teamed with Matt Lownes, 35, of Vistar Media to visualize starting-lineup histories dating from the 1920s. Notwithstanding the setbacks, Fiedler said he intended to reboot the event next year. He suspected people were recuperating from Saturday night's Tech Week festivities at the Oval. "Maybe having it on a Sunday had something to do with it," he said, laughing.